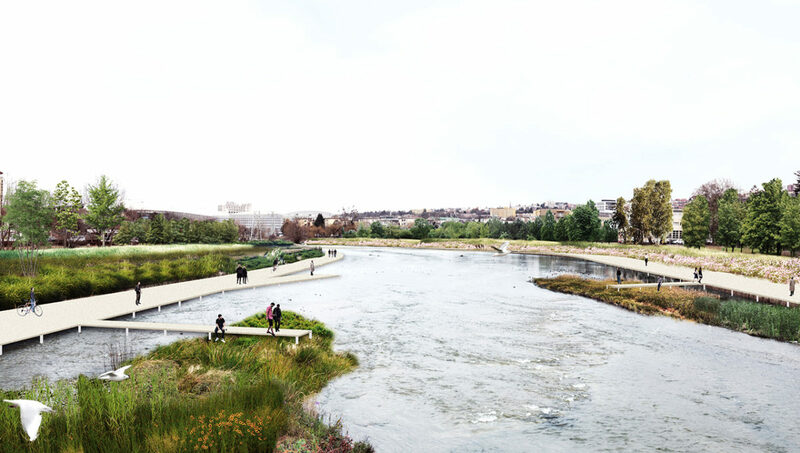 Producing a diverse range of solutions to the varied conditions of the river Somes, this proposal reimagines the role of the river as it crosses through Cluj-Napoca for over 15 kilometers. The Somes river is no longer understood as a thin line that divides the city in half but rather as a thick band that is part of Cluj-Napoca, incorporating distinct ecological systems and integrating public space. The Somes is envisioned as an urban connector of public spaces and green areas as well as the primary circulation path for pedestrians and bicycles. 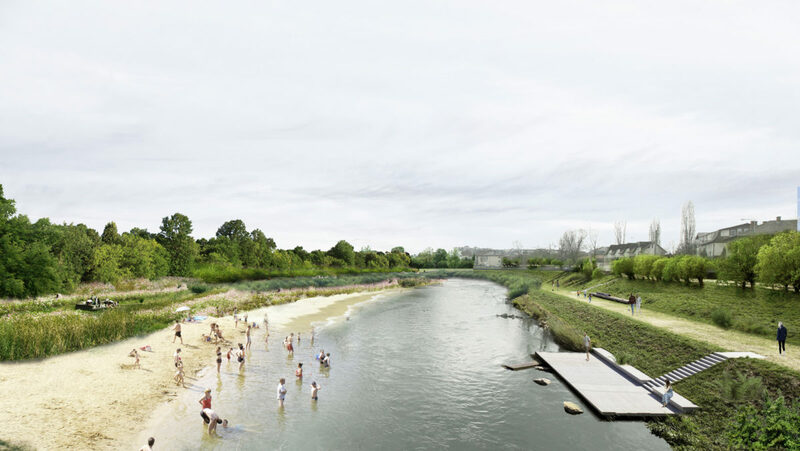 Thus, this proposal aims to bridge that gap between the river and the city. Firstly, a system of terraces expands the river’s edge and allows it to permeate into the urban fabric. As the river section is widened, the existing hard edge is transformed into a softer and more natural environment with the inclusion of local vegetation, rocks and sand. This system of terraces allows the river to become more accessible and incorporates areas for recreation where a diverse range of activities can take place. Secondly, a system of longitudinal bicycle and pedestrian paths give continuity to the circulation routes along the river, currently fragmented, and allows the Somes to become the primary spine of movement throughout the city. 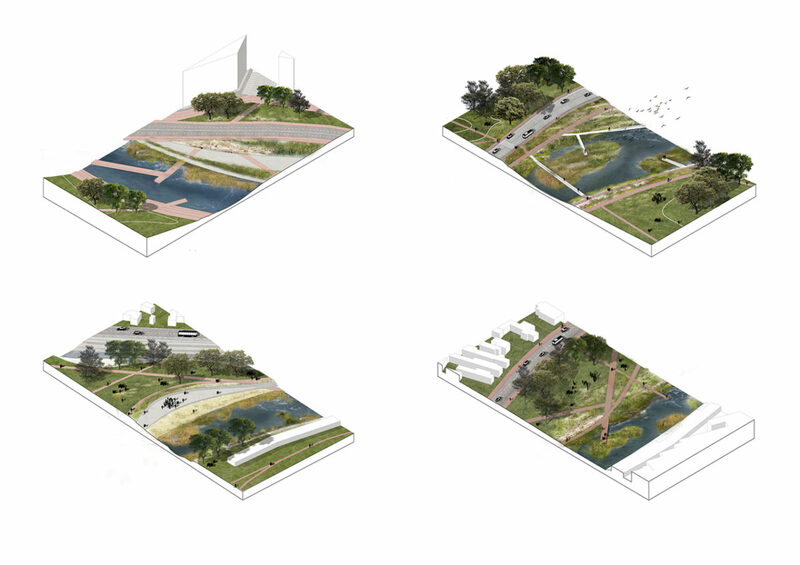 Thirdly, a system of diagonal paths aims to stitch the river and its immediate context. These paths redefine the existing urban connections by extending them to the water’s edge, creating a visual, and physical, connection between the city fabric and the river.